On these pages I illustrate a few of my lomotives. A lot of my models have been extensively modified. 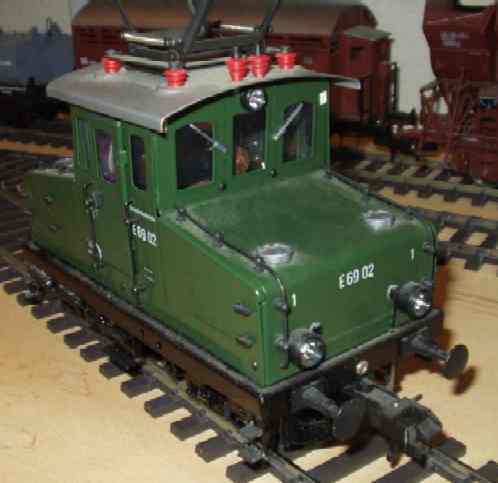 I often replace the decoders, the couplings,wheels, add various small parts, etc. BR18.4 - The Maxi model got all new electronics, including ESU decoder, new lights including cab lighting. I also added the wooden extension to the top of the tender, properly painted the tubing below the cab red, and added the missing conduits underneath the walkway. There's a picture of it the home page. E69 - The Maxi E69 is also a good candidate for supering. A new decoder, cab interior, more hoses and hardware on the chassis, some signs, and voila - a lovely model is made.